Famed journalist William Allen White gained these press passes so he could attend a significant international event--the Paris Peace Conference following World War I.
William Allen White did not initially support the United States entering World War I. But he changed his mind when the country declared war in the spring of 1917. With enthusiasm, the Kansas editor did everything from buying and selling liberty bonds to chairing local fund raising campaigns to making speeches about the war. He even donned a uniform as a designated inspector of Red Cross activities in Europe. Though he personally disliked President Woodrow Wilson, White supported the leader's war measures on the pages of his newspaper, the Emporia Gazette. White wasn't the only Kansan ambivalent about entering the conflict. Once called upon, though, Kansans supported the war effort in two major ways. Firstly, Kansas farmers nearly doubled their wheat production. Secondly, nearly 77,000 Kansans went to Europe to fight; 2,500 of them never made it back. White's own son, William Lindsey White (also known as Bill) began training in the Student Army Training Corps at the University of Kansas but never saw action due to the declaration of peace in November of 1918. The Paris Peace Conference began on January 12, 1919, just a few short months after the signing of the armistice. It was here that President Wilson would present his concept of a League of Nations, one of his Fourteen Points for Peace outlining the reconstruction of Europe and creating global peace. White was determined to be among the nearly 500 special correspondents present at this historic event. Although a prominent national figure, White faced the same challenges as other reporters in gaining access to the conference's closed-door events. He needed to secure a passport and a press pass. White appealed to the White House to be a member of President Wilson's peace party, but was denied. He next solicited John Phillips, editor of the Red Cross Magazine. Phillips commissioned White to write articles about demobilization efforts and helped him obtain the much-needed passport. A press pass was gained through White's newspaper syndicate. Syndicates first appeared in the 19th century as a service to rural papers lacking access to national stories and graphics, such as comics. Primarily based in urban areas, syndicates contracted with reporters (like White) and artists to provide material, which they then sold to smaller newspapers. White's contract with the Wheeler-Nicholson syndicate provided a stipend of about $1,000 per month, plus some expenses. A newspaper syndicate can also provide press passes for journalists reporting major events closed to the general public. At least two of White's passes (pictured here) were obtained through the Wheeler syndicate. White was also known to have done work for the McClure syndicate. View the opposite side of the pass at center, left. 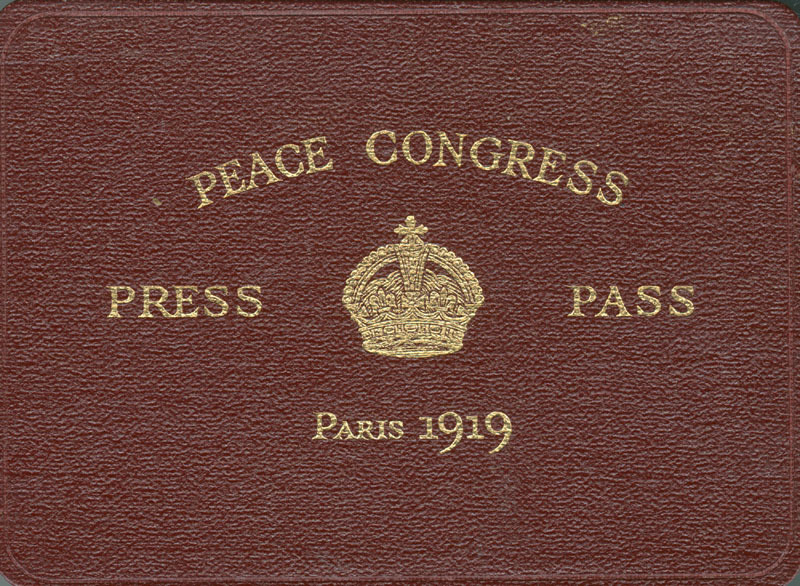 With his passport, press passes, and son Bill in tow, White set sail for Paris on a French ship named the Chicago in December of 1918. During the nearly five-month stay in Paris the passes entitled White to attend daily press conferences and gave him access to a cable service for wiring stories to his syndicate back in the U.S. The descendants of William Allen White donated this press pass and others to the Kansas Museum of History. Some of them are displayed at the Red Rocks State Historic Site.